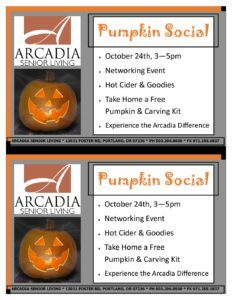 Join us at Arcadia for our Pumpkin Social! This networking event is for those in the senior care community who want to establish connections amongst other facilities as well as have a blast! Sip hot cider and take home your own pumpkin and carving kit for free just for attending!